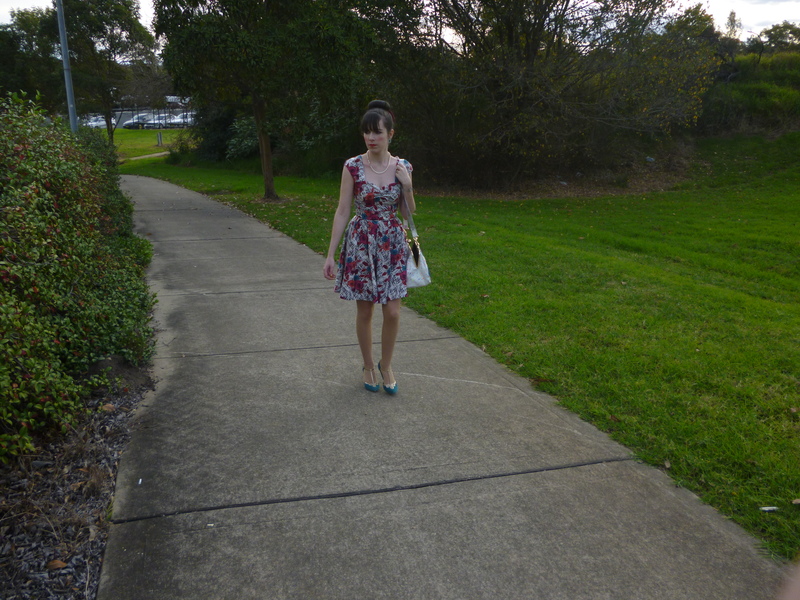 We experienced some lovely warm weather on the weekend so I was able to wear my new dress! I can’t believe I’m still able to dress like this only a few weeks away from winter; it’s a welcomed change since there have been some freezing cold days lately where I’ve really struggled to get out of bed for work. 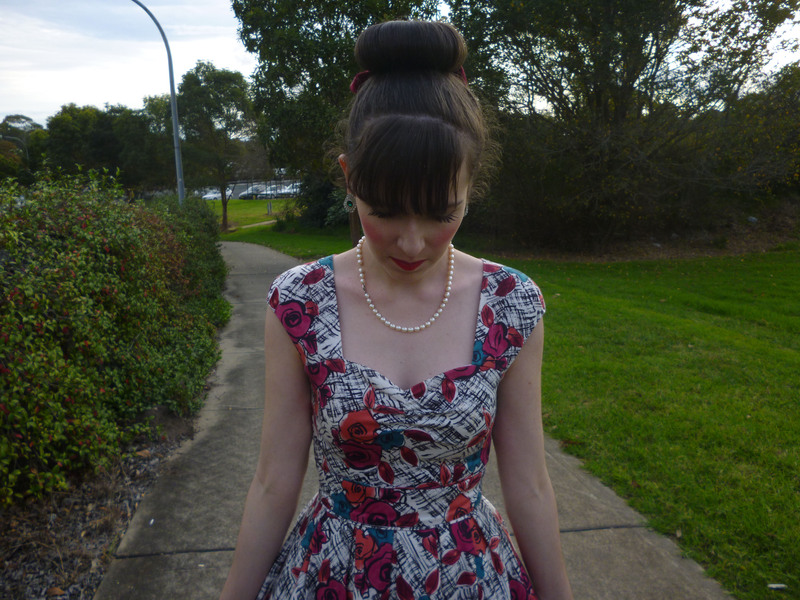 This dress is from Review and it’s my latest ebay bargain. I can’t believe what a great deal it was; a beautifully designed great quality piece for a fraction of the price. I must shop there more often. I love the bright colours against the black and white background; I didn’t have this concept in my wardrobe before. I also decided to wear my Seychelles heels; as I mentioned in my previous post, I’ve had these shoes for ages but haven’t worn them much lately since the colour is difficult to style. They are now back at the forefront of my wardrobe and I’ve rediscovered how much I love them. I was inspired to wear them again since they match perfectly the teal flowers on my dress. Of course I couldn’t resist using my unicorn bag; it’s so sparkly and exciting! Please send some positive vibes my way. 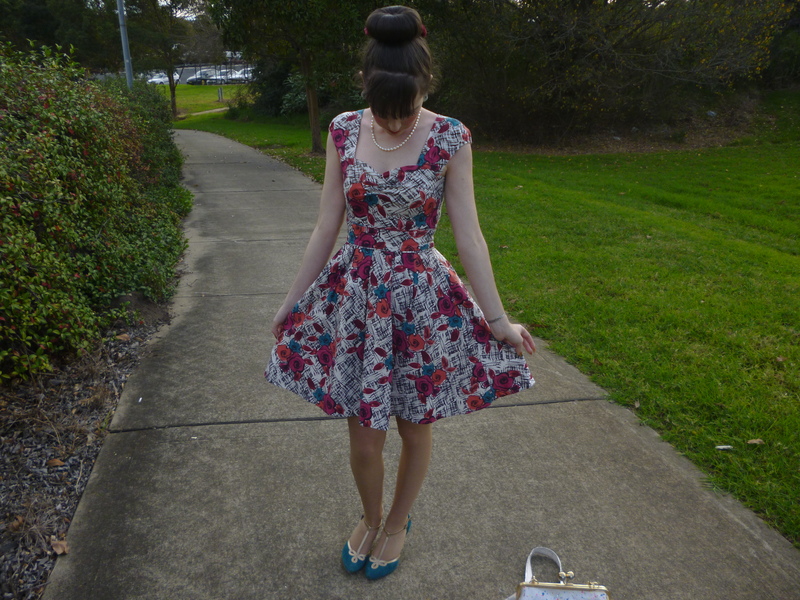 This entry was posted in Modcloth, Outfits, Review Australia. Bookmark the permalink. You look delightful, I love this dress on you; lovely style and the red roses are beautiful! Sending love and best wishes for a happy weekend! You look so pretty!!!! I love your dress!!! 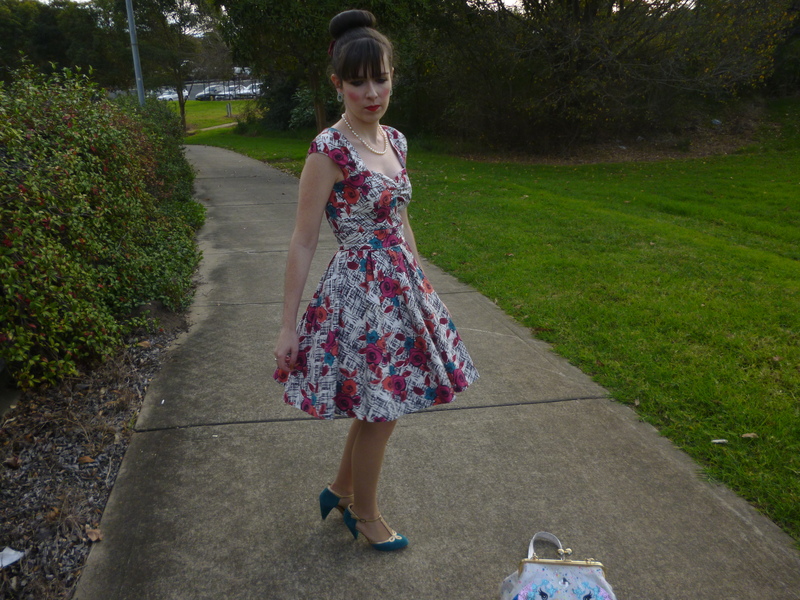 The cut and sweetheart neckline on that dress is absolutely perfect on you…and I love the print! What a nice dress, you really look beautiful! 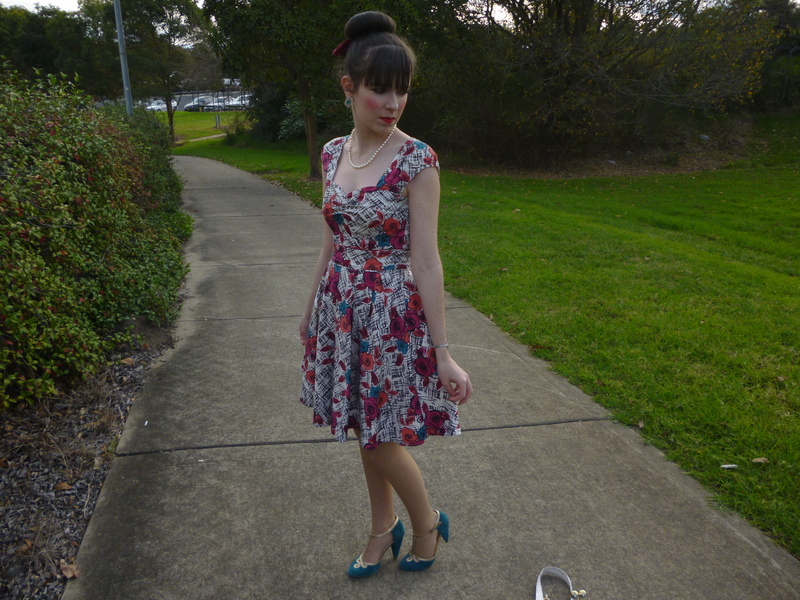 Such a pretty dress on you and stunning colour in the shoes. Sydney definately warmer than Tassie, no bare arms down here.Enjoy your weekend. Tia I absolutely LOVE your dress sense. 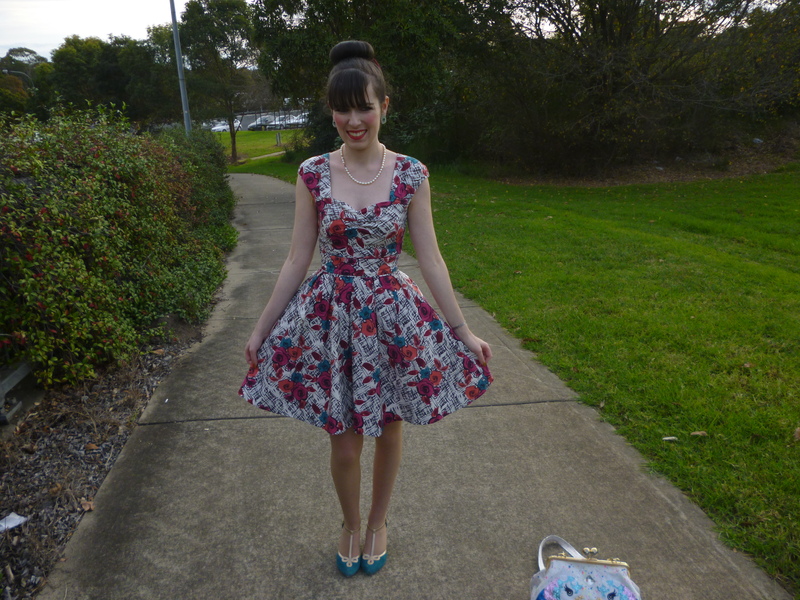 So beautiful and quirky as always – this looks is so 50's. And that bag is adorable! This dress is so you and it fits you wonderfully. 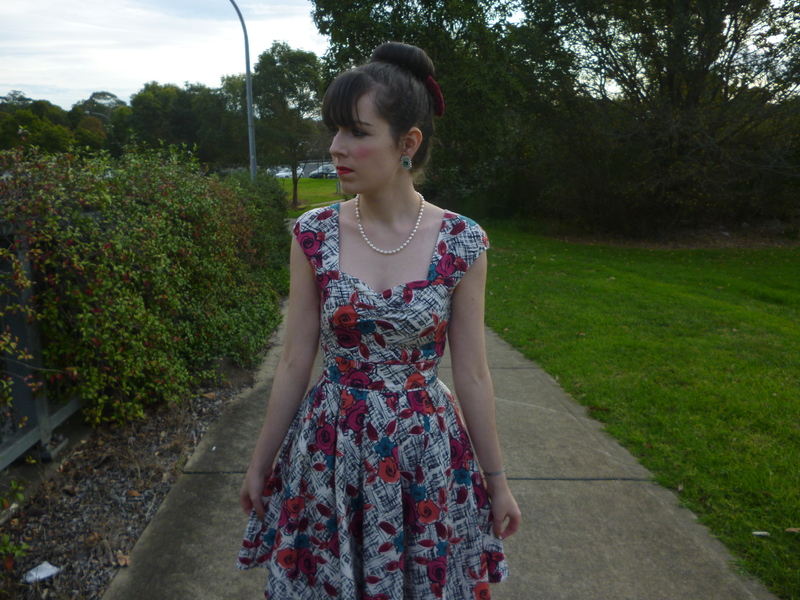 Ebay can be a good source for great finds and this dress is one of them. Thanks again for coming back to my blog. That's a lovely dress, you look amazing! Oh you look so amazing! I love your dress! very beautiful dress you have! Beautiful retro mood!